Reoccurring heel pain can often be traced back to something that you are doing wrong. Whether it the first time you have experienced heel pain or the fifth, the first place to look is at your shoes. If the soles of your shoes are showing wear they will typically begin to alter your gait. For many, this will cause reoccurring heel pain and knee pain. When the soles are worn on the outside it will cause your ankles to roll out a few degrees. In turn this will put your foot, ankle and knees in an unnatural position. Take a quick look at the following pictures to see if they resemble your shoes. 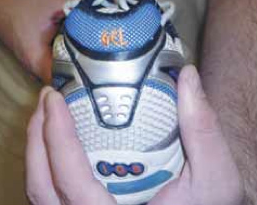 The heel counter is the back of the shoe that wraps around heel. With excessive use this portion of the shoe will breakdown and get soft. You should test your shoes heel counter by squeezing the back of the shoe. It should be firm, the heel counter is what controls the position of your calcaneus (heel bone). If your heel rotates in (pronation) or out (supination) to much it will surely cause biomechanical problems. Below is a picture of a worn out insole. 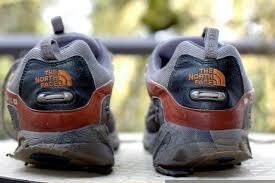 In running shoes most insoles will start to breakdown at 300 miles. At the 500 mile mark you can bet that they are causing your feet harm. Once the insole compresses it will not support the arch and metatarsal bones. This can cause everything from calluses, neuromas and plantar fasciitis. For a long lasting replacements checkout our Ultimate Heel & Arch Support. If you are still fighting off heel pain take a look at our Plantar Fasciitis Kit It was designed to cure Plantar Fasciitis and prevent it from coming back. Sign up for our newsletter and get regular information about foot pain.